That drainage looks blocked already. They should also visit roads done a few years ago to see the durability – like the ring road. 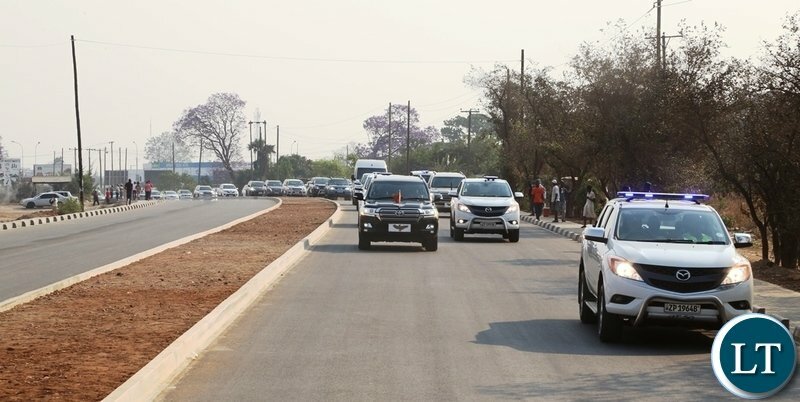 What a long convoy of cars, longer than Mugabe’s infamous presidential convoy. – Do we really need so many people/cars to tour a road? 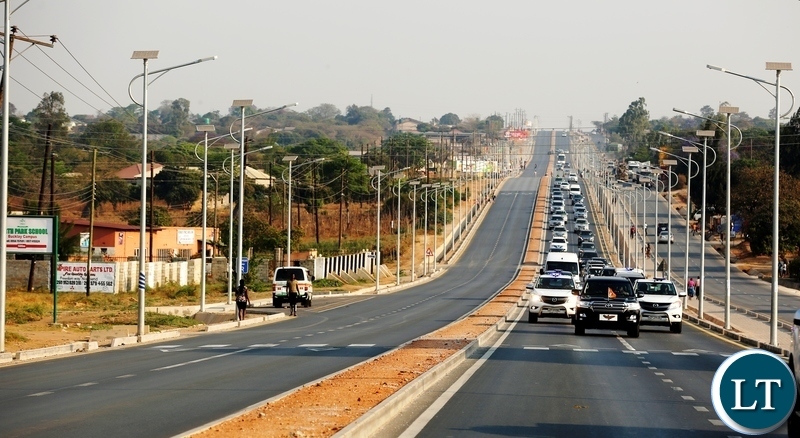 – Do we really need these roads at the expense of strangling ourselves, our kids, our grand-kids & great grand kids in unsustainable Chinese debt & in exchange for prime land, Indeni, NRDC, Zesco, KKIA & DeadNBC? All contracts are awarded to Chinese firms who use their own labour (ex-prisoners), raw materials & equipment from China. The conracts are signed in China & they do not pay taxes. The money does not touch local banks. What a sham of a president!!! SONTA OPO UMU CHINESE ABOMBA. Inspirational. 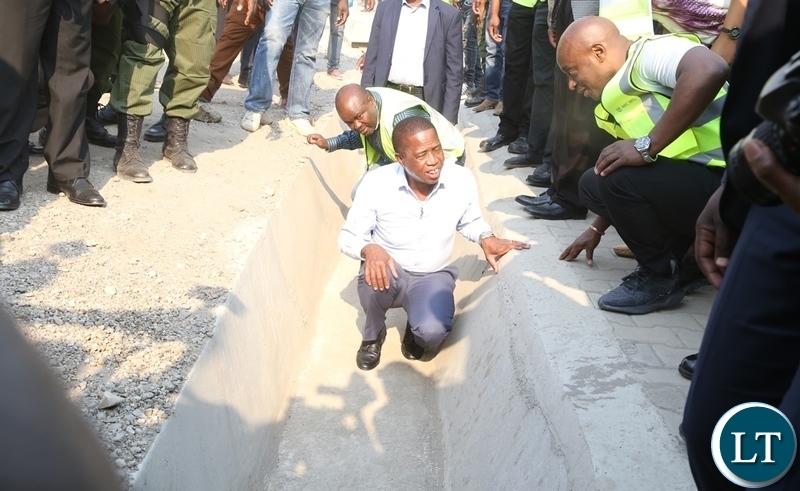 Well done President Lungu. That is a lot of solar powered street lights, every 5 meters is a Chinese aluminum light pole!! Now explains why road is costing $3million per km. I can count at least 40 motor vehicles. This man is really vision-less. He can’t think/comprehend beyond Chinese-funded roads which will be pot-holed in 3 years time whilst the debts will be on our backs for the next 200 years. Look at the suffering we went through in the late 80s & 90s over a $6-Billion debt. What more now with a debt of over $30 Billion? Why so many chinamen in the pictures. These people have really taken over Zambia. Kiki. This is all he can do to convince himself that he is doing something productive. Reality is haunting him when he sits alone in his office. The reports he is receiving are causing him sleepless nights. But worst of all, his conscience is tormenting him. He knows he is guilty. So the next best thing is to go out with his boot lickers to hear them sing his praise and how his great leadership is transforming the nation. 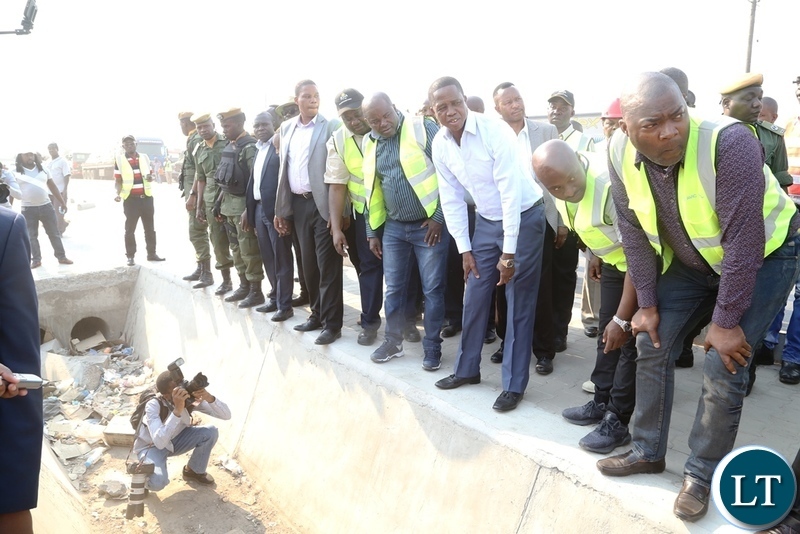 Fooling who with those overpriced projects, not durable and a machinery of corruption. All these people are not passionate about their country. They just want to steal. All those Vehicles?? 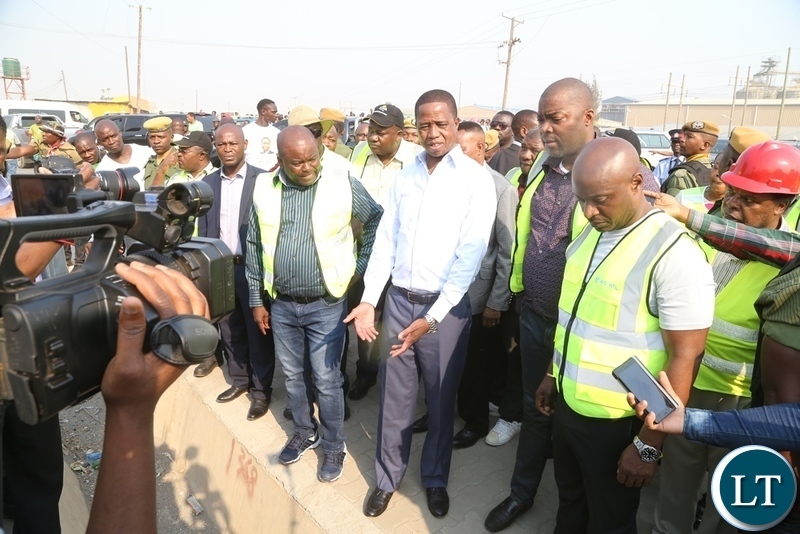 HH’s medulla looks blocked! He can’t see and appreciate good! It is a TONGA thing! All you saw is just a drainage and nothing else? You little god will NEVER a president in Zambia! Too much HaJealousy in the blood! Oh the trash in the drains already and the dust.Plus why is the unsafe pedestrian walkway constructed in between the carriageways instead of the sides ? 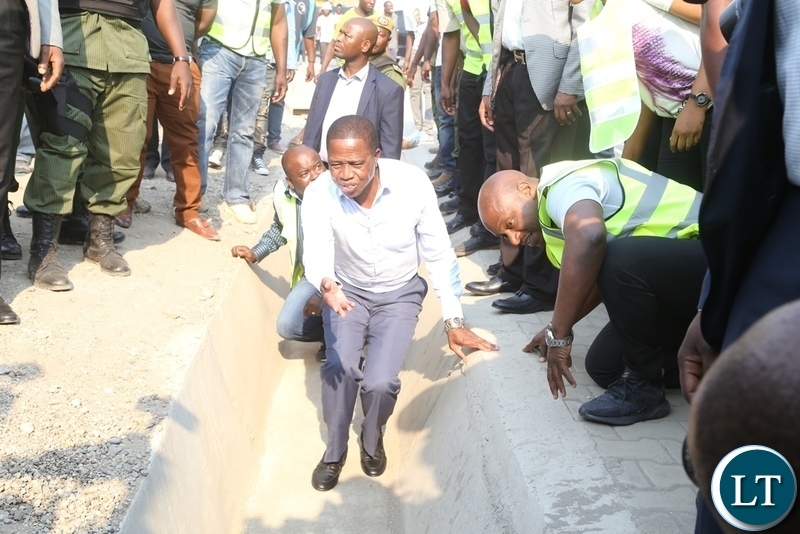 Who designed this rubbish road kanshi? 1. No filter lane for traffic turning right! A filter lane enables vehicles turning right to move off the main road to avoid being hit from behind. 2. No hard shoulder. This is the extra part of a road where broken vehicles can safely park while awaiting help. 3. Street lights too close to each other. List is endless. What is wrong with our city planners. HH has been trashed HORADY! Awe sure, inspecting Kaloba Projects. Huge sums of money have been stolen from us and they expect us to clap for them. How i wish all these projects were at affordable cost, at least two universities built in each of the ten provinces, more and more schools and colleges built . Alas, its all vanity. Knowing how Zambians behave why no footbridges and no road signs ? We need to green those brown patches too for health and aesthetics. Where is our money? Stop showing us sub standard roads when we know millions of pounds have been stolen meant for development purposes. Beautiful! It is jealousy HAGAIN! It is a Child of a Wizard. 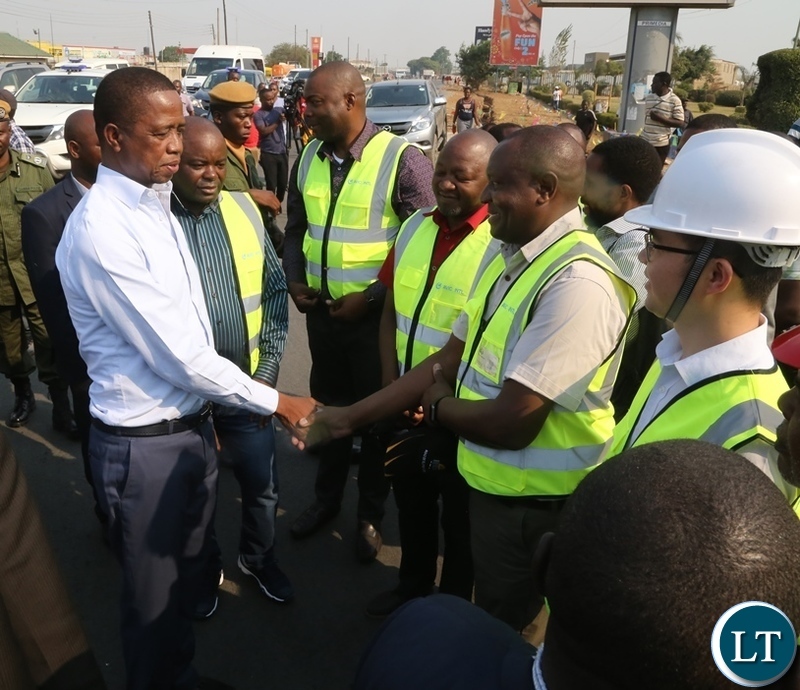 Kudos over road works but, we need to have in place proper a maintenance system with accountable officers who should be taken to task for the condition of the Roads. RDA doesn’t seem to have the capacity. The permanent Police Check Points cause unnecessary damage to the road. I don’t see their relevance now that the Police have a lot of patrol vehicles. Asphalt needs time to recover after loading. This happens naturally when vehicles are moving. The Permanent Police Check Points prevent the recovery process from happening. The ridiculously low speed limits don’t help either. But why does the drainage need to be an open pit? Cover the thing to make the road safe. Plant some trees and flowers to top it up, otherwise good work. The TONGA will kill you Mercury! And their supporters. Pedestrian crossing on a highway is so unsafe. Why not build an over pass instead and allow traffic the uninterrupted flow of traffic? This is a long stretch of road and as expected, cars will be doing in excess of 100Km/hr so there is high risk of pedestrians getting knocked down, especially when those pedestrian crossing markings are long gone and invisible. I am curious to see if roads in China are also designed the same way, no foot paths, no safe pedestrian crossing points, uninterrupted flow, filter lanes etc etc. If there is a terrible accident and both lanes are closed, how can traffic be redirected to avoid backing up? I can’t see any emergency or filter lanes. So many questions remained unanswered. 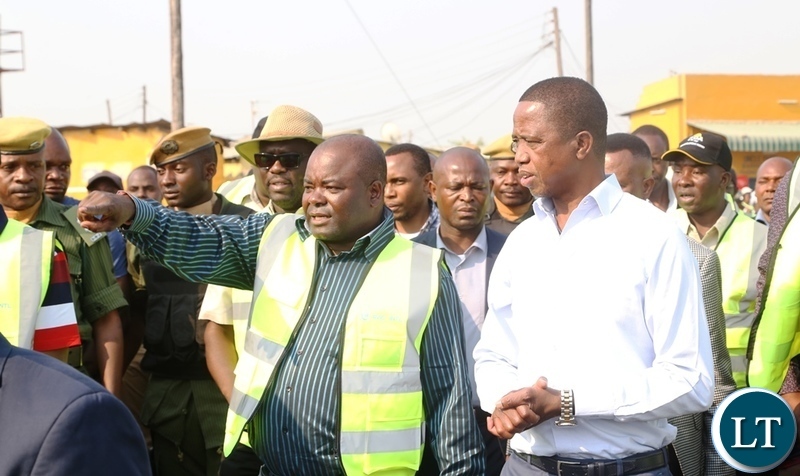 Mushota was in Zambia recently and talked about the greatness of the nation and how the country is progressing. That is the story of everyone except a TONGA, sory a UPND Under Five supporter. Fellow Zambian! It does not matter who is president today, tomorrow or yesterday if we remain unpatriotic and continue to steal even money meant for the poor. Do we surely expect the President to read all the reports and then tell people occupaying Offices what to do. Every Zambian occupaying an office of any magnitude, whether President or cleaner or housekeeper knows what is expected from them . Keep your eyes on the job. ???? 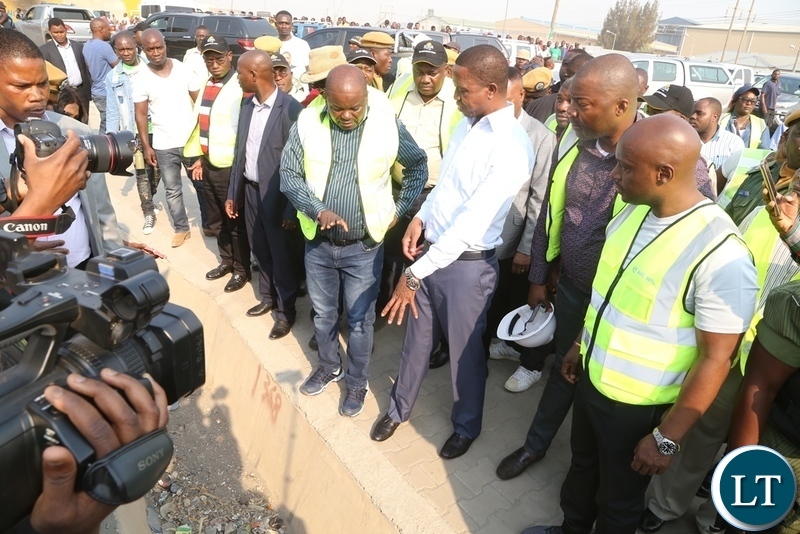 KAWALALA CHAKOLWA CHAGWA, IN HIS UBOMBA MWIBALA REPUBLIC, INSPECTING PREOJECT’S SO HE CAN CREAM OFF THE OVERPRICED INVOICE. 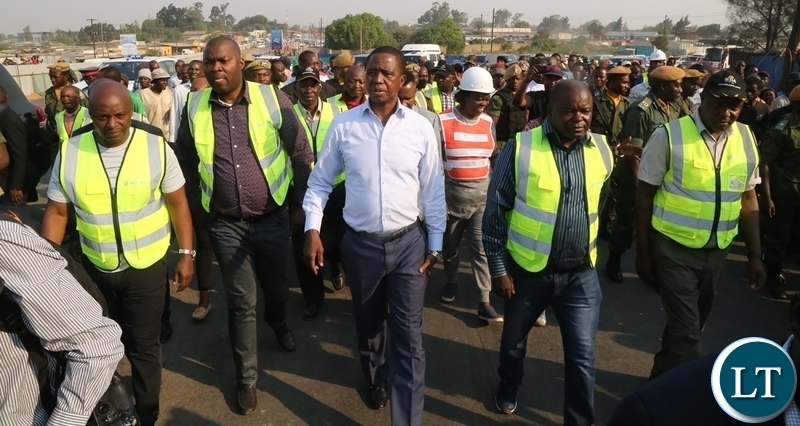 Fact; Zambia has most expensive road construction on the Planet, just as expensive as the Most expensive Cheap Wheelbarrow Fire Tenders on the Planet. THATS “VISIONLESS ” @ WORK FOR YOU! KELENI, YOU REALLY HAVE NO VISION! ENJOY YOUR STAY ABROAD WHILE IT LASTS. WE WILL DEVELOP OUR COUNTRY WITHOUT YOU. I’m really sorry to dissapoint you Nipnkak brainless P.F Cadre. To you vision is stealing from Widows, & the most vulnerable in society. To you vision is thinking with your belly & diseased ntwe.nu. Stay in that corrupt Cholera filth strewn failed Nation. You’ve got it spot on. I Don’t wish to live & rub shoulders with your type, who think open sewers is normal. Obviously you are part of the visionless embezzling P.F elite, but with the rainy season round the corner, Cholera is coming to claim those that you’ve deprived by your Greed, silly cadre. Plant some trees. Well done! Infrastructure development opens up other development. Business in the city will be eased by speedy movement. Makes no sense to spend 40 Minutes on the road to attend a 20 minutes meeting. Plant some trees. 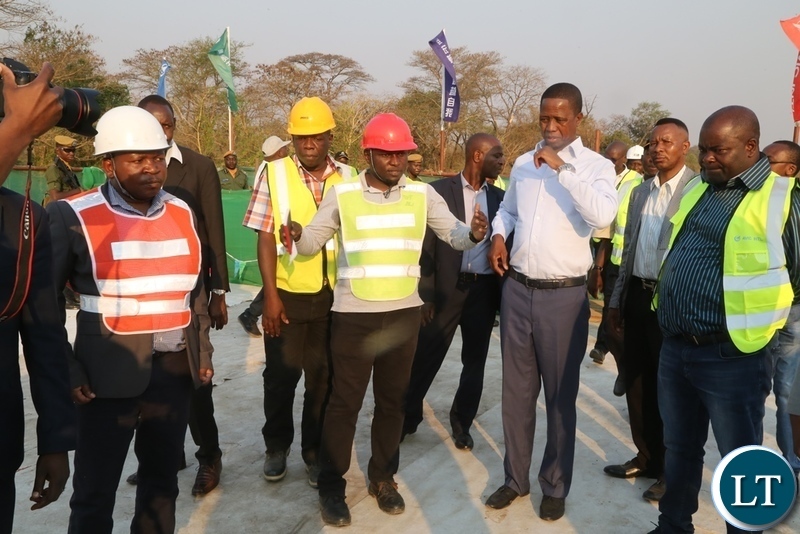 Privatization thief wants to sell Zambia! He is at work with his tribal mates with BOZA. God told him him and me! He didn’t talk to you yet? Oh the little god told you it was the one not our President and you never got the true memo! Arm pit smelling nation at it again. 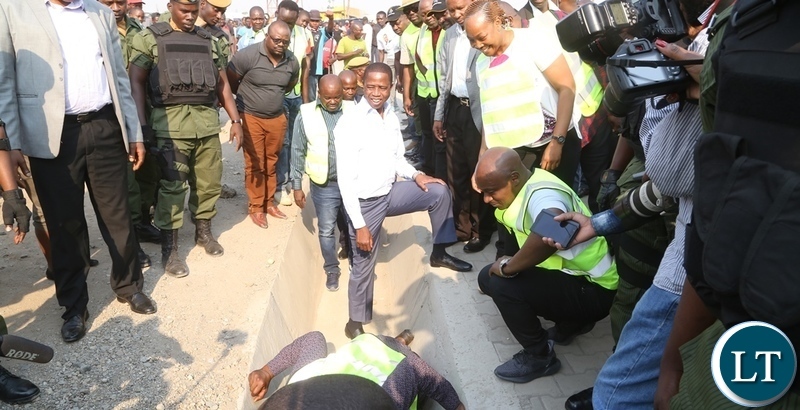 Do you really need foreigners to construct substandard roads? UNDER Five’s Armpit is smelling? Ask Charmaine and Mutinta to take care of it. MAD COW DISEASE and TRIBALS will much you for lunch! They are liars. Seen a lot of sellers of flowers struggling for business since most people building houses prefer to buy building materials & a beer to pump courage to berate the labourers & not landscaping plants. RDA should buy flowers and trees from the hard working street side sellers. They actually sell only a few types. So buying from all of them will provide enough for a landscape design. During cholera, those selling washers got empowered when they were bought for schools and health facilities. That would be a cool way to share the loan directly with some masses! I am jealous! Is it contagious? Where is the Mayor in all this?